The International Bible Contest for youth took place on Thursday morning, starting at 11:00 a.m.
Held annually on Israel Independence Day, the purpose of the contest, the Ministry of Education explains, is to unite the Jewish people in Israel and the Diaspora around the Bible - the root of all Jewish identity and values. Themed around the "ingathering of exiles" this year - as based on a verse from Ezekiel - contestants for the International Bible Contest were narrowed down to 16 outstanding finalists from both Israel and abroad. In the previous round sixty-seven contestants from 33 different countries, including the United States, Canada, Mexico, Panama, Turkey, South Africa and Brazil, competed. After a competitive and impressive two hours of play, the winner of the 2015 International Bible Contest was named as Eyal Yitzhak Matas, 15, a resident of Rehovot, who studies at the Darchei Noam, a private religious academy in Petah Tikva. In second place was Yisrael Elgrabli, 17, of the Horev Yeshiva in Jerusalem, one of the oldest yeshiva high schools in Israel. 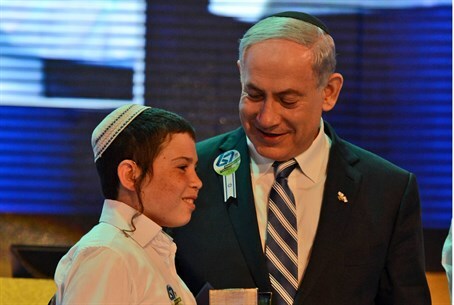 Prime Minister Binyamin Netanyahu met with the contestants earlier this week and wished them success. "The Bible is the foundation of our lives. We would not exist without it," he emphasized. "It reflects our identity and our values, which grew in this Land. It also reflects the great hopes of our people to return to our homeland and build our homes there." "None of this would have happened without the Bible. Therefore, it is good to pore over this book day and night. The Bible is like an ever flowing spring and I wish you all success," Netanyahu added. Speaking at the conclusion of the competition, Netanyahu called on all of the contestants, who had traveled from around the world, to make aliyah to Israel. "Now you can go back to your homes. But return to us, to the Land of Israel. Make aliyah to the State of Israel. We are waiting for you."